Creek Bed Party or Upscale Tailgate? 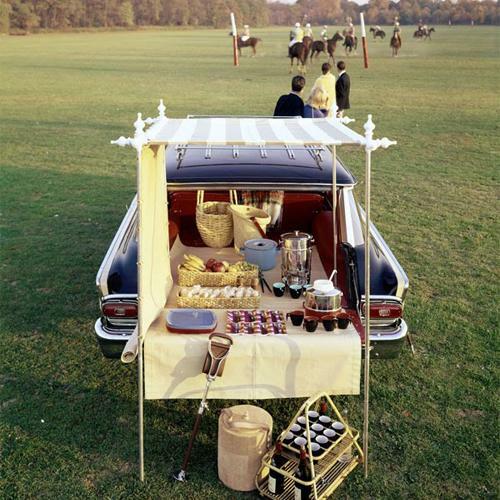 I found this picture on Pinterest recently, and it reminded me of my own attempt at a tailgate party. I joined the Lambda Chi Alpha fraternity my first week at Texas Tech University. For those of you not familiar, Texas Tech is in Lubbock Texas. About 250 miles from water, trees, green grass, a Bennigan’s…….anything really. It’s an island surrounded by flat barren dry Texas landscape. For some unknown reason, I was handed the reigns of organizing the chapter’s annual drunken booze-fest in the middle of a West Texas field…..that the brothers lovingly called “Creek Bed”. It was a 2 hour drive through the West Texas dust until “The 7 Sentinels” (they were trees. The only 7 trees for miles) and then a turn down another road of nothingness, untill you see an even smaller dirt road. At the end of the last dirt road/cattle path was it…Creek Bed. The perfect place to drink, pee, possibly puke, eventually pass out, and wake up in the desert. What joy. My bestest friend at the time was my fraternity brother Lenny. If I was 19, Lenny must have been 21. Lenny was always much older than me. He was (and still is) a portly, lockjawed man-child who was always fortunate enough to be my “Lucy”….and I, his willing “Ethel”. We both shared an affinity for Polo oxfords with madras ties, J.D. Salinger novels, all things British, and the pink and green bullion crested navy blue blazers that active fraternity brothers had the privilege of wearing. 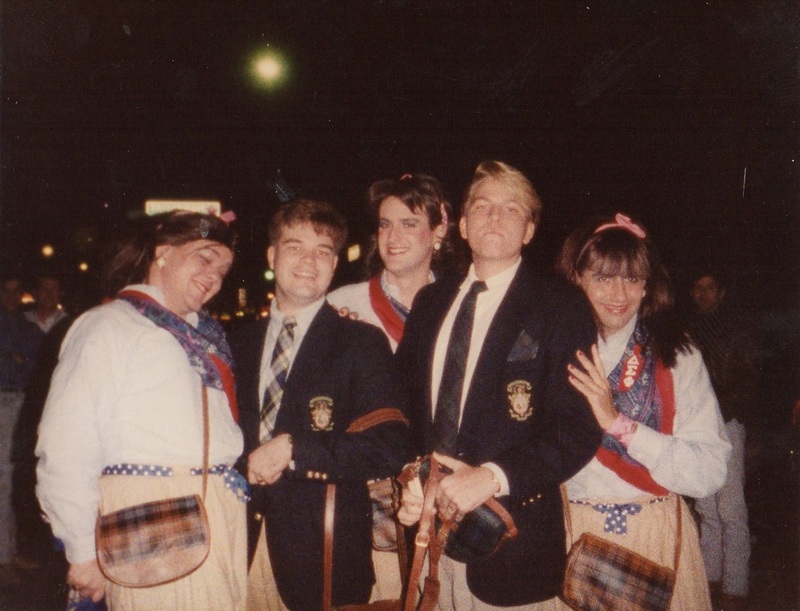 Here we are in 1988 with a some not too cute sorority girls, and the aforementioned crested navy blazers. “Wouldn’t it be fun to have an Upscale Tailgate?” To this day, I still think it was all Lenny’s idea.” We could do the whole shin-dig out of the back of Siegelbaum.” Siegelbaum was the name Lenny had given to his navy blue Saab hatchback. Our total budget was $100. It doesn’t sound like much now……and I assure you, it wasn’t very much in 1988 either. We had to be clever….and clever we were. The 2 of us, armed with our parent’s “In Case of Emergency Only” college credit cards, hit Service Merchandise, J.C. Penny’s and Sears for assorted silver-plate serving pieces and even a huge pressed glass punchbowl. The highlight of the quest was when Lenny found a 2 foot tall champagne bucket with handles at an outlet store. It looked just like a polo trophy. This was to be our center piece. Every serving piece box was carefully kept in the original store bag with a meticulously taped-on reciept…they would all be cleaned, repackaged and returned to the stores the Monday after the party. I “borrowed” 100 white linen napkins from my campus job in the faculty club. A candelabra, we absolutely had to have a candelabra…..and Lenny knew of one with 4 arms that we could use for the evening. It was all coming together nicely. All $100 we spent at the best grocery store in Lubbock. There were only 3 at the time. That night, when everyone arrived convoy-style at the end of the dirt road, in the creek bed, Lenny and I were standing there waiting in our pink and green bullion crested navy blue blazers with our “upscale tailgate”. A cassette of violin music wafted through Siegelbaum’s speakers. Everything spread out perfectly on “rented” silver serving platers under that 4-armed candelabra in the back of a Saab. There was a small spiral cut ham, baby Swiss slices, Hawaiian rolls, and spicy grain mustard for making finger sandwiches. There were butter crackers for my famous 7 layer dip. We had home-made Quiche Loraine, and I think a handful of boiled shrimp. (Maybe 20 total) For sweets, there was a box of delicate little Danish shortbread cookies. The centerpiece was the trophy-shaped champagne bucket overflowing with carrots and celery like an edible bouquet of cru de te. The only drink we offered was our “Upscale Tailgate” punch. The recipe came straight from a 1962 copy of the Ladies’ Home Journal. (This was before the internet) We served it in those tiny little glass punch cups with the handles that are too small for a grown man’s fingers to slip through. I still remember it as just a mound of sweet, green foam. Ingredients as follows – 2 cans of pineapple juice, 1 pint of lime sherbet, and 2 liters of Ginger ale. That’s all. No fun …… for a group of wanting-to-binge-drink-’till-everybody-puked college kids. It never occurred to us that a few dozen fraternity boys, and their assorted girlfriends, didn’t want un-alchohol laden lime-sherbet punch…..or finger sandwiches……or quiche Loraine…… or even cru de te. They were expecting a keg at the end of that long, long drive. That $100 they alloted us would have covered the cost of a keg with some to spare for red Solo cups. We had neglected to mention that it was a B.Y.O.B. party and it was too late for anyone to drive back 2 plus hours to a liquor store, or even Taco Bell. Lenny and I single-handedly managed to ruin the tradition of “Creek Bed” party. As far as I know, this was the last time the party was ever attempted. A few months later at our annual formal banquet, while everyone else in attendance was enjoying a fine steak dinner, Lenny and I were served cold, uncooked hot dogs on stale buns. The joke was on all of them……. because my date that night was a vegetarian. and Lenny? He happens to like cold, uncooked hotdogs.